Combine style and functionality with the Russell Hobbs Freestanding American Style Fridge Freezer. The iconic heritage brand has developed the perfect centrepiece for your kitchen - the modern black design oozes class whilst also providing exceptional functionality to make you the envy of your friends. Space needn't be an issue, with: 5 door racks, 4 shelves and 2 drawers in the fridge, and 5 door racks, 3 shelves and 2 drawers in the freezer - there's plenty of space for all your food types. For added convenience there's also a 4 bottle wine rack and an ice maker, ideal for keeping your drinks cool. Efficiency is paramount, and with an impressive A+ Efficiency performance rating, this Russell Hobbs Fridge Freezer could save you money whilst also reducing your carbon footprint. Easy to use, the RH90FF176B-WD has a sleek electronic LED display enabling you to manually set the temperature, as well as an optional child lock providing added peace of mind. 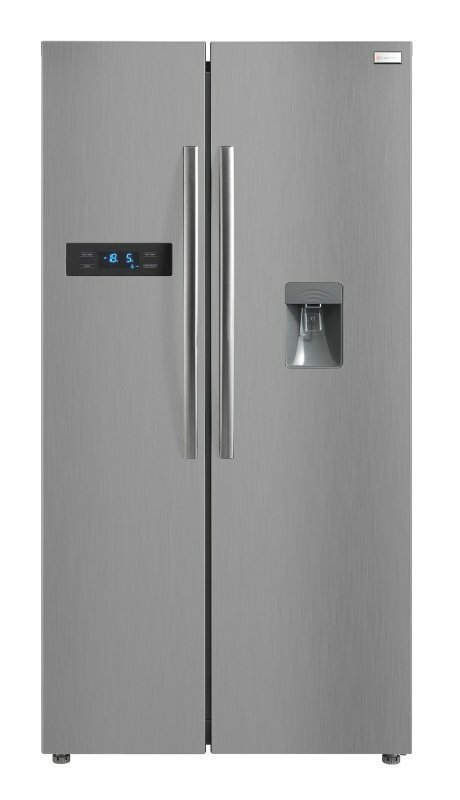 For your convenience, this American Style Fridge Freezer has a water dispenser so you can easily have an ice cold glass of water at the press of a lever.